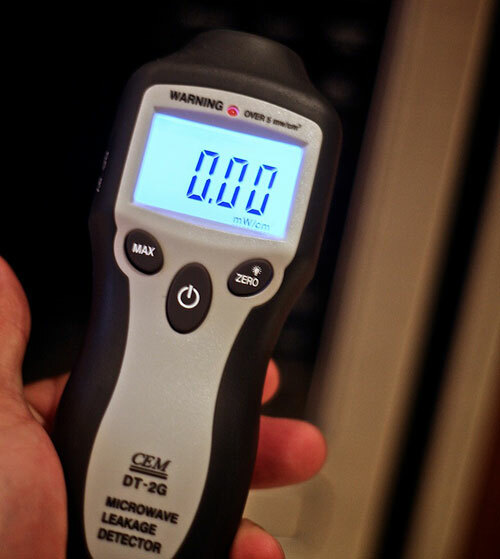 The responsible folks over at LESS EMF INC. sent me the new version of the Microwave Leakage/EMF Detector that I blogged about last year. The CEM DT-2G offers a backlit LCD display and an even higher sensitivity meter that never needs calibration. The meter also provides an audible “beeping” alarm and red flashing light when it senses microwaves above the 5 mW/cm². It’s sensitive down to 0.01 mW/cm² at 2450 MHz and will read all the way up to a roasting 9.99 mW/cm² in hundredths of mW/cm². The battery operates for more than 12 months under normal use and comes complete with carry case to keep your unit in perfect condition. The CEM DT-2G can also be used to measure radiated power from wireless keyboards, modems, cell phones and all other wireless devices using the 2450 MHz analog frequency. The meter is available now and retails for $34.95. I measured my home and I’m in safe ranges… phew!